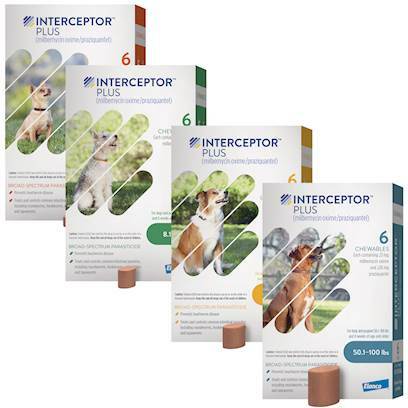 Interceptor Plus is a monthly prescription medication for the prevention of heartworm disease caused by Dirofilaria immitis; and for the treatment and control of adult roundworm, adult hookworm, adult whipworm, and adult tapeworm in puppies or dogs. You can start protecting your puppies and dogs as young as 6 weeks weighing over 2 pounds. Interceptor Plus should be administered at monthly intervals beginning within 1 month of the dog's first seasonal exposure to mosquitoes and continuing until at least 6 months after the dog's last seasonal exposure. Interceptor Plus may be administered year-round without interruption. When switching from another heartworm preventative product to Interceptor Plus, the first dose of Interceptor Plus should be given within a month of the last dose of the former product. In addition to being effective, particular attention has been paid to improved chicken flavor which makes taking the medication more appetizing for your pet and less of a task for you. Side effects are rare, but can include vomiting, diarrhea, depression/lethary, ataxia, anorexia, convulsions, weakness and salivation.